(Review by Hugh C/Photos courtesy of Rachel). 'Twas a rain-lashed Easter Eve when 30 or so of the faithful gathered in the western margins of the Beboposphere at The Little Angel Cafe, Hexham. Diners had finished their pizza and gelati, glasses or mugs (according to taste) were charged. 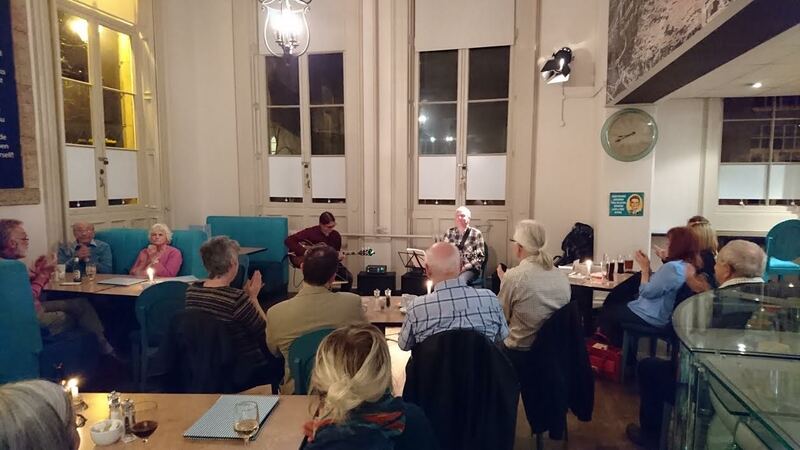 At the appointed hour (8pm) an expectant hush descended on those assembled and in the glow of the single spotlight the jazz guitar maestri James Birkett and Bradley Johnston took to the floor (there is no stage - it is a cafe). We were to be a treated to a whirlwind tour of the oeuvre from the 1920s to the contemporary. We started with Blues for PJ and were next in Brazil with Antonio Carlos Jobim's Wave then back in 1920s USA with Joe Venuti and Eddie Lang's duo, Stringing the Blues – the part of Venuti's violin ably taken by Johnston on guitar. We were then treated to a beautiful ballad by Pat Metheny (a favourite of the duo as you might expect) - Farmer's Trust. Gypsy jazz then came to the fore with Biréli Lagrène's Fisco Place, the two guitarists chasing each other at rapid speed, but ending together bang on the note. Brazilian composer Luiz Bonfa's Una Prece followed then a guitar version of Sonny Rollins' Doxy. The first set was finished by the quickfire round – Django Reinhardt's Suite Number Four. It was at this point that James Birkett suggested the guys needed “a little lie down”. • The art of improvisation is not confined to Early Music/Baroque and Jazz as is commonly thought, but extended well into the Classical period – Beethoven, in particular, was an arch improvisor who could produce a whole piece from a short musical segment thrown at him by an audience member. • It is urban myth that the grand London music colleges were the first in this country to run courses in jazz studies – in fact, these courses started in the North of England - Newcastle, Leeds and Salford in particular, at a time when the practice rooms of the London colleges still had notices on the walls to the effect of THIS PIANO MUST NOT BE USED FOR THE PLAYING OF JAZZ! Refreshed in both mind and body then, the second half commenced with an energetic rendition of another Sonny Rollins number, Oleo. The duo then cooled off with a three- time piece – John Lewis' Skating in Central Park. Perfect, by Eddie Lang followed leading into a bravura rendition of Coltrane's Giant Steps – as James Birkett put it “we sometimes like to set ourselves a challenge – there's a key change about every eight seconds”. The bluesy Blue Room (Eddie Lang/Lonnie Johnson) then Reinhardt's Large followed ending up at the penultimate number, Burt Bacharach's Alfie. It was probably the sensuous rendition of this balladic song that prompted one audience member to speak to the meeting, a distinct “Yeah!” could be heard at the end. And here we were, at the final number. Throughout the evening, the set list had been fluid, with Birkett and Johnston choosing the music played as they went along. A brief introduction from Birkett to each piece provided background and context. The title was announced: Chick Corea's Spain - the famous introduction from Rodrigo's Concierto de Aranjuez stunningly presented by Johnston. This was a tour de force and served as an excellent finale. Overall this was an excellent evening in the sort of venue most suited to this kind of music, an intimate space with cabaret style seating and easily available refreshment. I thoroughly enjoyed it, was educated – and the pizza was good too! What's not to like? 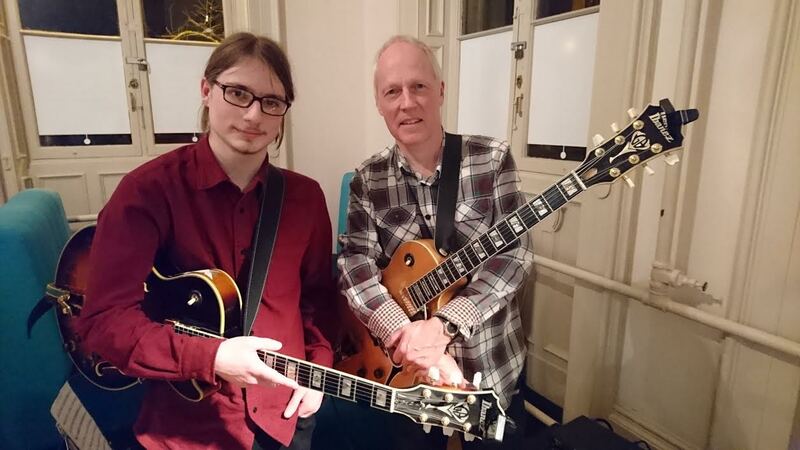 The James Birkett/Bradley Johnston Jazz Guitar Duo can be experienced at Ushaw College, Durham on April 29 at 7.30 pm and at the Lit and Phil, Newcastle on June 24 at 1 pm.